Anne Krebiehl hat für das Wine Enthusiast Magazin (USA) unsere klassischen Grüner Veltliner unter die Lupe genommen und lobt sie sehr. Der Grüner Veltliner HAIDVIERTEL Weinviertel DAC 2015 wird gar mit 91 Punkten belohnt. Hier die Beschreibung dazu: „Ripe notes of yellow plum dance on the palate against a firm, citric background of immense freshness. This stands with poise and a seriously straight back. The midpalate is as savoury as soy sauce. Totally enlivening and refreshing with a lovely, concentrated core and backbone.“ Aber auch der Grüner Veltliner VOM HAUS 2015 wird sehr gelobt: „Yeasty savor, tick. Fresh zestiness, tick. Lemon and pear flavors, tick. This must be archetypal, soft and fresh Grüner. 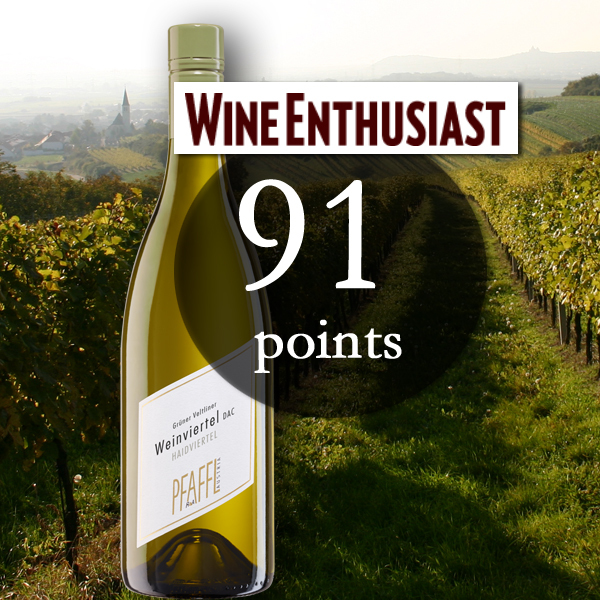 This one has a fluid, supple body and goes down far too easily, leaving a wake of peppery pear behind.“ Er staubt 89 Punkte und ein „Best Buy“ ab! DANKESCHÖN!